Kombucha, Kefir and Kickapoo Kimchi! Oh, My! I love our local and homemade options for friendly gut health! For those who don’t know, kombucha is a fermented beverage made from tea, sugar and a special “SCOBY” culture that creates friendly bacteria and symbiotic yeast. For details on health benefits, you can click right here. 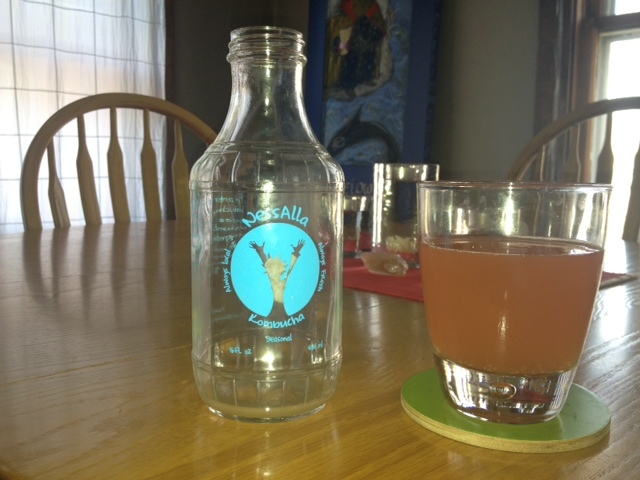 I don’t drink it often, but when I do, I love supporting Madison’s very own kombucha brewer, Nessala. Today’s flavor? Seasonal Hibiscus-St. John’s Wort-Siberian Ginseng. You can also make your own ‘booch with their handy dandy starter kits. I’ve not braved kombucha making yet, although I do have an unactivated SCOBY back from my Sedona 2007 days. I’ve heard stories about the SCOBY’s taking over, but our friend, Sue, feeds her chickens the leftovers and they seem to thrive on it! Seed starters, fermenting kefir and soaked and dehydrated buckwheat groats. “Kefir’s tart and refreshing flavor is similar to a drinking-style yogurt, but it contains beneficial yeast as well as friendly ‘probiotic’ bacteria found in yogurt. The naturally occurring bacteria and yeast in kefir combine symbiotically to give superior health benefits when consumed regularly. It is loaded with valuable vitamins and minerals and contains easily digestible complete proteins. As you know, I provide information only on this blog, so I can’t make any “real” health claims except from personal experience. That said, kefir rocks! At various times in my life, I’ve had coconut milk kefir, coconut water kefir, raw milk kefir, and it all makes me feel good! I first learned of coconut milk kefir from my friend/former neighbor, Cecilia, who used Body Ecology Starters with fresh coconut meat/water blends. She even had some success with a bottled version of flash pasteurized coconut milk. Kefir “grains” add so many enzymes and digestive aids that, while fresh is best, you really can’t go wrong with kefir — provided it’s homemade. The commercial brands filled with guar gum are quite another story, at least in my experience! Rumble, rumble, if you know what I mean. When I drink homemade kefir, my body hums. I’ve also heard enough testimonials from people with formerly autistic children to know there’s something powerful in that fermentation. If you want a superfood version of Breyer’s Peaches ‘n Cream ice cream, try frozen organic peaches blended with milk/coconut milk/nutmylk kefir and a splash of vanilla stevia. Wow. 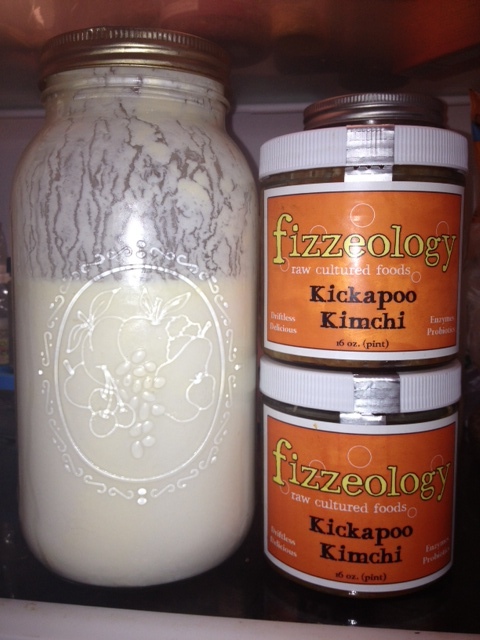 Fully "ready" kefir and kimchi from fizziology. And the kimchi! I just can’t say enough good things about our local fizzeology fermented veggies. Sure, we could make our own and sometimes do. David has a “Perfect Pickler,” which truly does make perfect pickles and no-stink-up-the-kitchen kraut. But we met fizzeology’s Mike Bieser at a health expo where I spoke last year. He puts burdock root in his kimchi! Enough said. I love, love, love burdock! Can’t get enough. I also love the other flavors, especially ones with a Mexican flare. When you can find fermented foods this good and this local, and you’re this lazy, it just feels right to go support your local co-op, which now stocks Mike’s tasty, healthy treats. I particularly like Kickapoo Kimchi on avocados or wrapped in nori sheets for fast, satisfying snacks. Just to clarify: the peaches and cream would be made with ONE of those types of kefir, not all combined. I think the latter would be a recipe for a bellyache, whereas the former tastes like childhood summers before anyone knew what GMO was and back when ice cream seemed like a respectable way to get your five servings of fruits and vegetables. At least it did for me! I’ve finally garnered up the courage to start brewing my own kombucha! Do you have Sandor Katz’s “Wild Fermentation” book? He’s definitely a kindred spirit … anyway, I’m on a “wild fermentation” kick, making sauerkraut, brewing kombucha, and eager to explore kefir and fermented grain porridge and a zillion other things. Not sure whence the inspiration came, because I’m the quintessential “lazy raw foodist” (and if you hadn’t taken the name, I’d be all over it), but I’m loving the DIY-path. And with fermentation, the recipes aren’t all that hard. It’s one of those things (like soaking nuts for nut milk) that requires planning, not time or effort. Have you had my fermented cacao recipe? Mmmmm. U may love it. 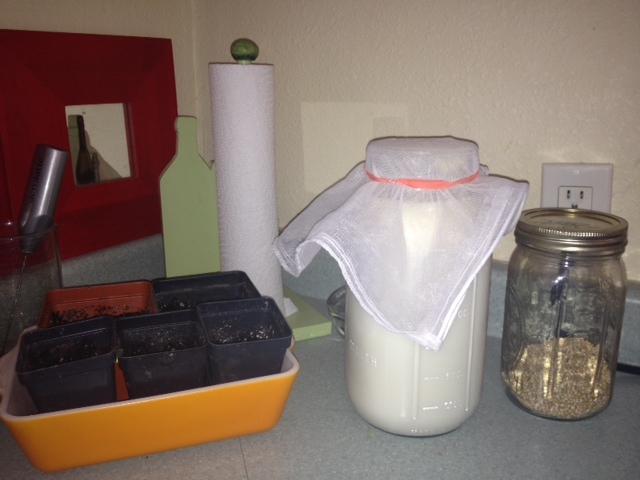 I live in Madison and would like to start my own kefir but don’t know where to get some milk grains. Any inquiries I have made on the internet have made with no response. Anyone in Madison, WI with some grains I could get to start my own kefir? We are having a raw food potluck at Tenney Park Beach on June 21st, starting at 5:30. I have given away a lot of grains, but mine should have multiplied enough again by then if you want to pick some up. Please let me know, though, as I wouldn’t normally be walking around with a jar full of kefir grains!